I’m glad I am not as good as Bill in solving these puzzles. What would I do with the other 50 minutes I allot to complete them? Like was said, we find a way to fill that hour. It used to be that it would take that long or more for me just for this puzzle or another easier puzzle if I couldn’t do the LAT ones, especially later in the week if I could do it at all. There’s always more puzzles waiting to try out to fill the other 50 minutes (and sometimes more like with todays much harder than normal WSJ puzzle). Or other stuff. LAT: 9:44, no errors, but with lots of missteps again (and I’m beginning to really dislike the WP site). Newsday: 5:57, no errors. 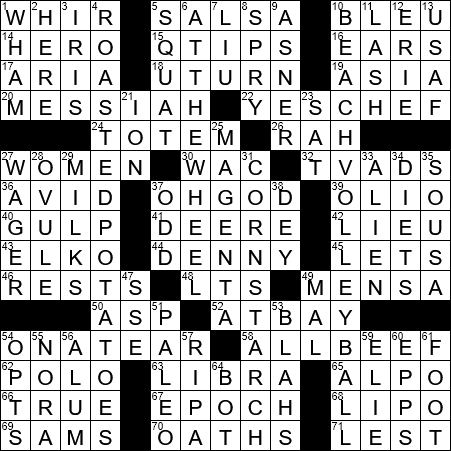 I had a toughish time with this puzzle, with a feraed constructor. Had to hunt and peck – but finally finished. I enjoyed it never the less. Bill … A small typo, housekeeping … on 27 Across WOMEN, … in the last line of the para, Felton was mistyped as Feltman. Unless she married a Feltman, at 88 years old. ( I was wondering who was this Feltman, that I missed. ) maybe it was a combination of Felton and freshman – a Freudian slip. I did not get the theme, drat. Bill, thank you for the story of the thresh hold – a factoid thats makes your blog such interesting and fascinating reading. ! The first time I read about this, was about or concerning a bride who was carried across the threshhold – and I thought maybe the threshhold was there to hold or bind the bride to the house …. quaint. Regarding liposuction, my ex-neighbor had lipo done, plus a stomach stapling, to lose ~ 120 lbs …. unfortunately she gained some of that back over the next year. Maybe, a body’s philosophy of metabolism is more powerful than we give it credit for …. Didn’t have much of a problem except for 35D “march king”. I wanted to put in St. Pat. because of March but knew that wasn’t working. Finally got Sousa and finished. And for a change, I got the theme which made it fall together fast. Did this one last night. 15 minutes….ish, if I remember correctly. Got the theme about halfway through. Maybe I was tired, but nothing seemed to come easy with this one. Originally I had an issue with MAGENTA. I always thought MAGENTA was the red cartridge in a laser printer. I went and looked up the definition of MAGENTA and was more confused than before: I copied and pasted it here for laughs…..
That definition seems to contradict itself in more than one place. You almost have to believe pink and purple are the same to believe all that. I also thought purple was 50% red and blue each. Oh well, I’m a little color deficient anyway (statistically so are most men to some degree). I see color just fine normally. Late at night looking at a distant light, red and green can look very similar to me though. When they start making MAGENTA lights, I think I’m in trouble…..
Btw I’ve taken on a second career……i.e. looking for a house to buy here. It seems to be taking the same amount of time as my actual income generating career…. Wow I hate this process. I’m looking at it like a 20 or 30 year commitment (not exactly my forte) so I’m sure there’s some sort of neurosis at play here too. Jeff! Good luck on your house hunt! ? Vegas suburbs, or more central? I’m glad I am not as good as Bill at solving these puzzles. What would I do with the other 50 minutes I allot to complete them? You’ve reminded me of a comedian’s routine from years ago. He told the story of a beautiful actress who claimed she spent an hour every day of her life listening to people tell her how beautiful she is. He was talking about his “extra hour” he has every day and then whenever heckled would tell the heckler he too has an extra hour every day…..
Nice easy Wechsler Wednesday; took about 10-12 minutes with no errors. Off to bed early for the market tomorrow after skipping last week due to rain/wind. @Carrie – Yeah sorry too, the slots at the Integratron fill up super quick and I’d like a nice relaxed trip. Cool too, I just got a call to ship a pint of my honey to Pasadena from an earlier student of SFSU. Nice puzzle! Nothing special, except that I once again have the opportunity to mention that MENSA means “stupid” in Spanish!! (It’s the feminine form.) The joke is on those too-smart MENSA members!! ? Just saw an episode of the old Bob Newhart Show, from about 1972, wherein Bob finds​ out that Emily’s IQ is higher than his. Bob: 129. Emily: 151. Bob tries to act as if the difference doesn’t bother him. They go to a party hosted by the High IQ Club, and some brilliant dork brags that he can instantly say anyone’s name backwards!! Then he’s introduced to Bob…. OMG I do love my old TV shows! ? Dirk! Can I buy your soap yet?